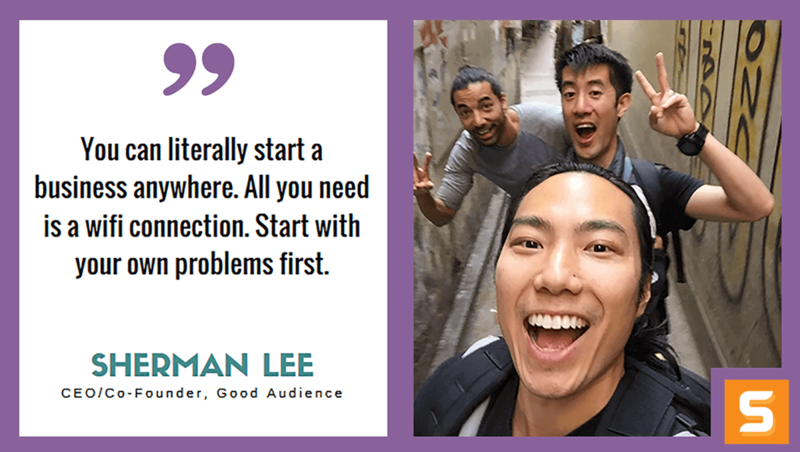 Sherman Lee is the co-founder of Good Audience, a remote marketing team that specializes in increasing social media audience and traffic. He loves startups, traveling and coding. He studied CS at Berkeley, scaled Yahoo's Content platform from 0 to 600M users, and managed over 250 social media accounts for businesses. In this Startup Savant interview, Sherman opens up how he started his entrepreneurial journey without much background in entrepreneurship. He also shares that failing is part of the journey and that he wants to fail like a hundred times more to learn more. Find out more about Sherman's insights in the following paragraphs. Be sure to give him a shoutout on Twitter! I went to a talk by Paul Graham at UC Berkeley about how to start a startup. I had absolutely no idea what an entrepreneur or a startup was. I was just studying computer science and hacking on things. He painted this absolutely amazing picture about the journey he went through. It sounded like a wild ride and I was interested in making stories. What does Good Audience do that makes it better than the rest? In other words, what is your competitive advantage and how did you find it? We help existing marketing teams grow and scale their team. Most agencies work in silos. We integrate directly into the marketing team and execute campaigns. Finding this took a lot of patience :) We listened and learned from our customers. Every day is a grind for sure. Sales calls, customer calls, sync up with the team, etc. What I make sure to do every single day is to reflect on how the business is doing and thinking deeply. Once you've been in a space long enough, seemingly obvious things become deep insights that nobody has. You need to make time to dig those out. We thought raising VC money was going to accelerate our business. Actually, it almost killed our startup. In the end we learned that building a real business with real revenue is all that mattered to survive. I think most entrepreneurs give up when things become hard. You start to doubt yourself and you can get into a death spiral. It's important to understand that you will always fail. Once you learn that, you won't be afraid to go out there and take risks. The most fun part about this is the day-to-day journey. We run a fully remote company and nobody has a physical location restriction. So I closed a deal in the Swiss countryside, partied with Nigerian princes in London, and messed about with the HomeAway.com team in Paris for a pilot. We wanna keep the journey going for as long as possible. I'm not afraid to fail or make mistakes. It's gonna happen. Failing is progress forward. So this allows me to learn a lot of things in a short amount of time. What are the top success tips that you would give anyone starting a business in California? Don't forget to enjoy the journey. It'll be tough, but it'll be fun. You can literally start a business anywhere. All you need is a wifi connection. Start with your own problems first. For us, we had a t-shirt line and needed to figure out how to drive sales. So we followed 50,000 teenagers and sold $3K worth of merchandise. Then we realized many e-commerce sites didn't know how to execute social media campaigns.